Looking for tips on how to advise discoverers on their assessment results? Go to Advise Discoverers. In this section, we cover the basics of Holland’s theory, the most common scoring patterns and how discoverers view their assessment results. Discoverers reach their results after completing the short Career Key assessment. The results explain what it all means, including numeric scores for each of Holland’s six personality types. Based on these results, discoverers make a close personality-match to a career or education program. You may be familiar with Holland’s Theory, and here we refresh the details and share specifically Career Key’s interpretation and application. With this perspective, you can make best use of Career Key Discovery (CKD). Dr. John Holland’s basic idea is that a person is most likely to be successful and satisfied in a career if their personality is like the personalities of the people working in it. Similarly, a student is more likely to get better grades, stay in their major or program, and graduate on time if their personality is like the students and professors studying and teaching in their program. In other words, whatever choice someone makes — a career to enter; a course or training program; a college major; a career change, vocation, or retirement focus — they are usually best off choosing one that matches their personality. Major research studies support this idea. The distance on the hexagon between each type indicates how close they are psychologically. For example, notice that the type at the greatest distance from the Realistic type is Social. When you read the descriptions for these two types (Realistic and Social), you understand why: their personalities are opposites! Understanding all of this can help in many ways. People of the same personality type tend to “flock together.” For example, Artistic people like to make friends and work with Artistic people. People of the same personality type working together create a work environment that fits their type. For example, Artistic people working together create an environment that rewards artistic thinking and behavior—an Artistic environment. Six environments types with the same names match the personality types: Realistic, Investigative, Artistic, Social, Enterprising, and Conventional. People who work in an environment similar to their personality type are more likely to be successful and satisfied. Artistic people, for example, are more likely to be successful and satisfied if they choose a job that has an Artistic environment, like a dance teacher in a dancing school—an environment “dominated” by Artistic type people where creative abilities and expression are highly valued. Working with people of a similar personality to yours enables you to do many things they do, and to feel more comfortable. Immediately after answering assessment questions, discoverers receive the Assessment Results. The Results page reveals a numeric score ranging from 0 to 33 points for each personality type. The higher the score, the more a discoverer is like that type. And the more comfortable they will be in a work or program environment of that type. A meaningful difference in scoring between types is 5 points. If fewer than 5 points separates results for different personality types, consider the strength of those types as the same. 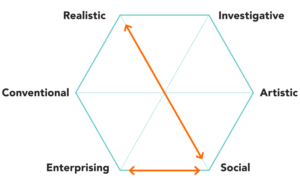 To help discoverers quickly understand their scores, CKD assigns each personality type score to one of three levels that indicate the impact to the discoverer: thriving, promising or challenging. Thriving environments means a discoverer is most likely to thrive and succeed in work or program environments like these (they match their highest scores). Promising environments means a discoverer may be comfortable and succeed in work or program environments like these (they are fairly close to their highest scoring personality type). Challenging environments means these work or program environments will likely be demanding and uncomfortable for a discoverer. Other environments better fit their personality. CKD offers different advice to discoverers depending on the pattern of their scores. The last two patterns, Three or More Top Types and Inconsistent Types, may prove more challenging for discoverers to act upon and also quite valuable in the job market. We find discoverers with these results are more likely to need a little extra advice and support. For how to advise discovers for each scoring pattern, go to Advise Discoverers. Then, we guide them through the next step of the discovery and matching process, finding careers and/or programs of study that best fit the discoverer.